Australia was gripped by Footloose fever this week in 1984, with the soundtrack album sitting at number 6, the movie's title track at number 1 on the singles chart and its second single debuting on the top 50 on its way to the top 10. The new hit from the film would also become the second top 10 single for its performer, who hadn't been seen on the chart in six years - and wound up as one of my favourite songs from the year. 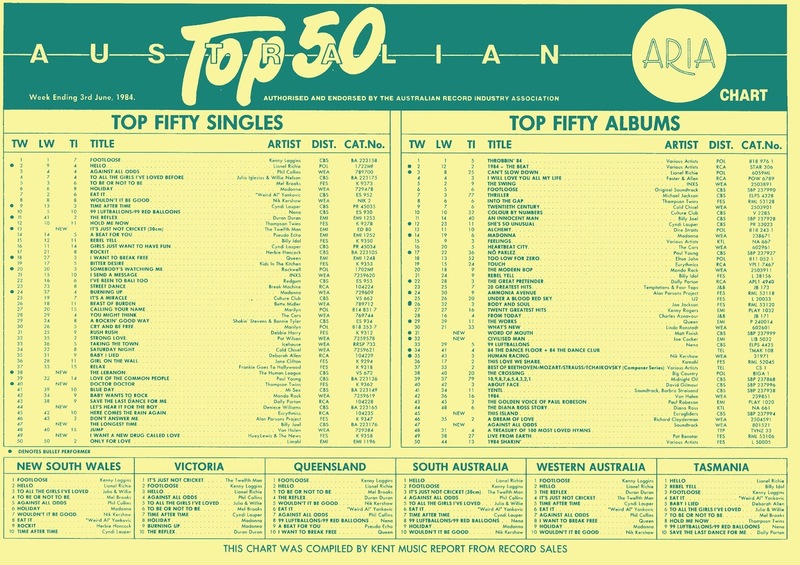 As for Kenny Loggins' "Footloose", it registered its third week on top of the ARIA top 50 - but Lionel Richie was closing in on the number 1 spot fast. Despite its title, this would be the final chart appearance for Matt Finish. Lead singer Matt Moffitt would have more success when he debuted as a solo artist nearly two years later. With a slightly extended title for Australian audiences, "I Want A New Drug" (as it was actually called) became another mid-table hit for Huey Lewis And The News - the second single from Sports to place in the 20s. Despite Sports yielding a couple of chart hits by this stage, it wouldn't actually appear on the albums top 100 at all until November (when "If This Is It" became successful) - over a year after its release. Around this time, Huey Lewis began working on songs for Back To The Future and "I Want A New Drug" was used as placeholder music until "The Power Of Love" was written. His commitment to that film meant he declined an offer to write the theme to Ghostbusters, but when Ray Parker Jr's title track for the movie sounded too close to "I Want A New Drug", Huey took legal action. Billy Joel's tour through the music of his youth continued to bear fruit with the fourth hit from An Innocent Man returning him to the top 20 (after the title track peaked at number 23). The almost a cappella "The Longest Time" was modelled after the doo-wop style of Frankie Lymon And The Teenagers (known for "Why Do Fools Fall In Love") and, despite what the music video suggested, Billy performed all the vocal parts (and claps and clicks) himself. Pop songs don't get much more joyous than this. The second massive hit from Footloose, "Let's Hear It For The Boy" played in the movie while Ren (Kevin Bacon) taught Willard (Chris Penn) how to dance. 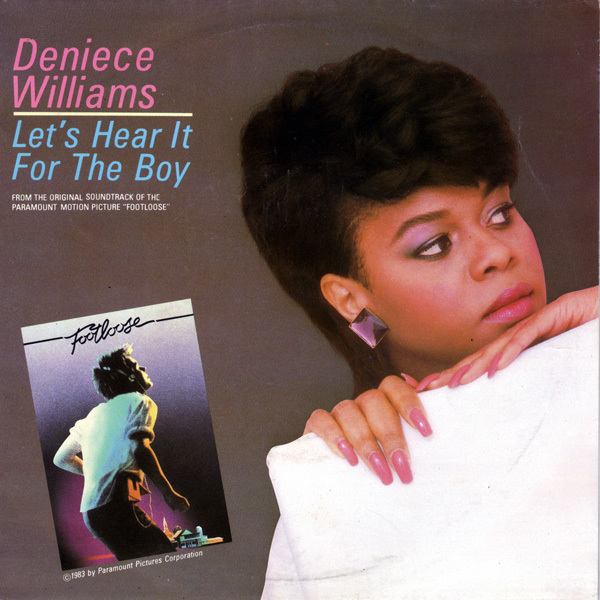 The upbeat smash hit brought singer Deniece Williams back to the Australian chart for the first time since her 1978 duet with Johnny Matthis "Too Much, Too Little, Too Late" reached number 6. For Deniece, who'd grown up in a small religious town in Indiana, the story of Footloose resonated with her, but funnily enough, despite being nominated at the 1985 Grammys for the song, she performed at the ceremony singing a gospel track instead. Unfortunately, none of the other singles from her album, also called Let's Hear It For The Boy, or any subsequent album charted locally, giving her the status of a two-hit wonder in Australia. When we looked back at "Hold Me Now" (which fell out of the top 10 this week) earlier in the year, I asked whether it would lead to more international mega-hits. And here's the answer: follow-up "Doctor! Doctor!" was another globally successful single for the trio - and is actually my favourite track by the band. In the UK, "Doctor! Doctor!" outperformed "Hold Me Now", by reaching number 3 - but their highest-charting single there was still to come. In Australia, they never did reach the top 10 again but "Doctor! Doctor!" came closest. Speaking of missing the top 10, this lead single from The Human League's Hysteria album fell some way short of matching their last three Australian hits, which had all peaked inside the top 10. In the UK, "The Lebanon" broke a string of six consecutive top 10 hits. Unlike Thompson Twins, who were hitting their commercial peak, The Human League took a detour from the sound that had made them a worldwide success on the Dare album, and stand-alone singles "Mirror Man" and "(Keep Feeling) Fascination". As well as featuring prominent guitars, "The Lebanon" also contained a widely maligned political message about the civil war in Lebanon at the time. The song, like Hysteria, which came out three years after Dare and got its name from the fraught recording process, was a commercial stumble for the band, who would take a completely different approach to their next album in 1986. He'd written the number 1 single of 1983, and so it was only a matter of time until we heard from comedian Billy Birmingham again. And indeed, we actually heard Billy perform himself on "It's Just Not Cricket" as he impersonated cricket commentators like Richie Benaud and Tony Grieg, made fun of the Pakistani team members' names and let drop an expletive or several. The 12" single was a runaway success, tapping into the Aussie tradition of watching Channel 9's coverage of the cricket all summer long, and setting up The Twelfth Man for a lengthy career of chart-topping singles and albums. 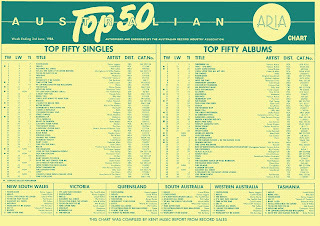 "It's Just Not Cricket" itself spent three weeks at number 1 and ended the year as Australia's number 2 single of 1984. Careful not to overdo it, The Twelfth Man wouldn't be back on the singles chart until 1992, by which time he'd also achieved two spaced out chart-topping albums - 1987's Wired World Of Sports and 12th Man Again in 1990. Next week: the song that beat "It's Just Not Cricket" to take out the title of number 1 song of 1984 - without ever reaching the top of the chart. Plus, a song that was blocked from number 1 by The Twelfth Man. I guess 'I Want a New Drug' had to be re-named for its local release due to the different meaning 'drug' has here than in the US, being used more often for the illicit variety. I had no idea 'The Longest Time' was a 1984 single; it sounds more-dated, like it could be 1980/1, or even the late 70s. But then, I thought 'Just the Way You Are' was from 1984, given how often radio was still playing it that year. How odd that the 12th Man video, on an official channel by the looks of it, is sourced from rage. I never heard the 'song' until it aired on rage a few years back. I don't know how someone could listen to it more than once and still find it funny (though it wasn't funny even once for me). Nathan - where did you grow up? I listened to Brisbane radio at the time and I don't recall hearing "Just The Way You Are" on pop stations (but they played a lot of 83/84 era Billy Joel, including "The Longest Time"). I grew up in regional Vic but we had Melbourne radio stations. And I agree how crazily overpriced music was back then, once you factor in inflation. $9.99 for CD singles (as they initially were) in 1991 = $18.38 in 2016, and $19.99 for cassette albums in 1990 = $36.78 in 2016. $28.95 for a CD (as Brashs charged) in 1992 = $52.73 in 2016. Yikes! I love Doctor Doctor! One of my favourite Thompson Twins songs. King for a day would probably just be ahead for me but this is also a gem. Let's hear it for the boy is another fantastic song & receives plenty of airplay on mainstream stations. Never heard of The Lebanon previously. Don't you want me, Keep feeling fascination & Mirror Man I'm familiar with (all awesome songs btw) but never came across this one. Seems like they went astray from their Synth/New Wave stuff & went slightly with more of a rock feel. You can still notice it but it's less prominent to their previous material.